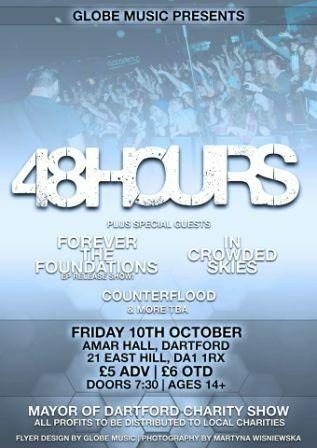 On the 10th October 2014, a charity gig night will be held at Amar Hall in Dartford in aid of the Mayor of Charity Gig Night Dartford Dartford Avtar Sandhu MBE's charities and groups. Looking to bring a unique way of fundraising to Dartford, the gig night is aimed at all ages with local rock, alternative and metal bands coming together to put on a show that Dartford won't forget in a long time! Headliners for the occasion are 48Hours, a local band with a big presence. After touring the UK over recent months, the 3 piece are looking forward to playing a local gig in aid of the Mayor of Dartford. Also playing catchy riffs and keeping your fists pumping are Forever the Foundations, In Crowded Skies and Counterflood with more to be announced on the night. Tickets for the event are £5.00 per person in advance or £6.00 per person on the door. The event begins at 7.30pm and a full bar is on site for you to have a refreshing pint or a crisp spirit and mixer.